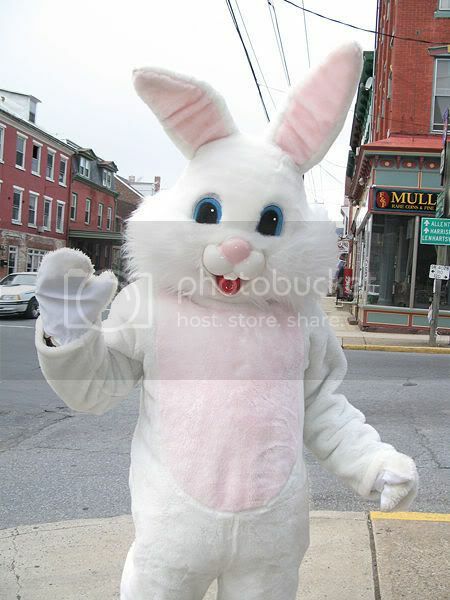 The Easter Bunny is a mythological rabbit who brings gifts and candy to children on the Easter holiday, most likely based on pre-Christian customs honoring the fertility goddess Eostre. In English, the etymology of the word "Easter" comes from an ancient pagan goddess of the spring named Eostre, related to German Ostara. According to popular folklore, Eostre once saved a bird whose wings had frozen during the winter by turning it into a rabbit. Because the rabbit had once been a bird, it could still lay eggs, and that rabbit became the modern Easter Bunny. The precise origin of the ancient custom of coloring eggs is not known. Greeks to this day typically dye their Easter eggs red, the color of blood, in recognition of the renewal of life in springtime (and, later, the blood of the sacrificed Christ). Some also use the color green, in honor of the new foliage emerging after the long dead time of winter. The idea of an egg-laying bunny came to the United States in the 18th century. German immigrants in the Pennsylvania Dutch area told their children about the "Osterhas," sometimes spelled "Oschter Haws." "Hase" means "hare," not rabbit, and in Northwest European folklore the "Easter Bunny" indeed is a hare, not a rabbit. According to the legend, only good children received gifts of colored eggs in the nests that they made in their caps and bonnets before Easter. In 1883, Jakob Grimm wrote of long-standing similar myths in Germany itself. Noting many related landmarks and customs, Grimm suggested that these derived from legends of Ostara. The German and Amish legends were most likely rooted in European folklore about hares' eggs which seems to have been a confusion between hares raising their young at ground level and the finding of plovers' nests nearby, abandoned by the adult birds to distract predators. Hares use a hollow called a form rather than a burrow. Lapwings nest on the same sort of ground, and their nests look very similar to hare forms. So in the Spring, eggs would be found in what looked like hare forms, giving rise to the belief that the hare laid eggs in the spring.